All rentals require a twenty percent non-refundable deposit on a major credit card. Shades are great for all occassions! Rentals include delivery; set-up and pick-up! 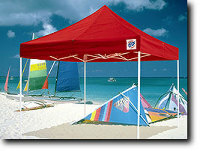 Contact us today to reserve your shade for that special event!! Home / Corporate / Rentals / Sales / Contact Us © 2002 Corporate Global Solutions. All rights reserved.